HomeBlogBraces Versus Removable Aligners: What’s the Best Fit for You? Braces are the best option for complex corrections and results are often noticeable sooner than with alternative treatments. Invisalign and other clear aligners involve removable trays that are custom for your mouth and don’t impact the aesthetics of your smile. The cost of either choice will depend on the type of correction you need and how involved your treatment will be. Consider your options and your lifestyle. If you don’t have the discipline required for clear aligners, you may want to choose traditional braces. 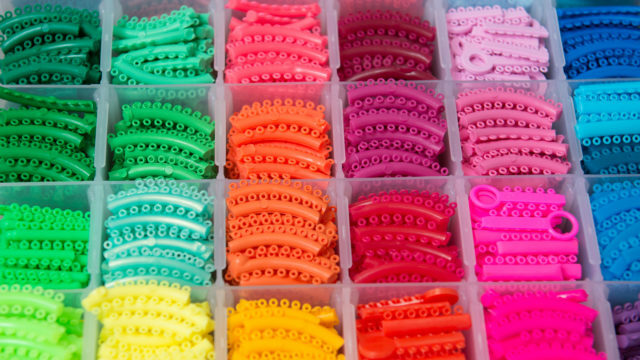 Thirty years ago, the only choice for people in braces was what color of bands you’d like to use. Today, there are more options to fix your smile and improve your oral health. If you’re considering straightening your teeth, you’re probably wondering which is better – braces or Invisalign. Traditional braces involve brackets attached to the teeth and connected by wires to move the teeth over time. You would need to keep regular appointments, every three to ten weeks, to replace the wires and bands as your teeth shift. There are many choices of materials and colors for traditional braces, including clear and ceramic brackets. Braces are the better option for complex corrections, like bridgework and back tooth bite problems. It is important to brush and floss regularly, but there is no extra care required. Your orthodontist will have more control over your progress with traditional braces and movement is often noticeable sooner. Traditional braces are worn 24/7 until your treatment is concluded. There can be some discomfort when your wires are replaced and you need to avoid sticky foods, like gum and taffy. You may notice discoloration of your teeth if you do not maintain proper brushing and flossing while wearing traditional braces. Clear aligners, like Invisalign, are known as the invisible option for straightening teeth. Detailed 3D imaging of your teeth is used to create a series of clear plastic trays that will shift your teeth over time. A tray is worn for a week or two then replaced with a new one. Follow-ups with your orthodontist would be every four to ten weeks to monitor progress and receive new sets of trays. Invisalign straightens teeth without impacting the aesthetics of your smile. Your trays are custom fit for your mouth. Desired realignment occurs over time without the discomfort of wires. The trays can be removed to eat and drink, so you don’t have to worry about food caught between brackets. Invisalign wearers don’t have food restrictions like those with traditional braces. Invisalign has become a popular option, but it requires discipline to wear the trays for at least 22 hours per day. There can be some minimal discomfort for the first few days of a new tray. Further, you would have to brush your teeth and trays after every meal to avoid staining. Ultimately, the cost of braces or clear aligners would depend on the length and depth of treatment. With traditional braces, the material you choose for brackets can affect the overall price, but treatment can range from $1800 to $5500. Invisalign and other clear aligners can average anywhere from $4200 to $5500. At the end of the day, it’s important to choose the option that works for you. Your lifestyle and personal habits are the best indicators for what you can handle, but you also need to consider what results you desire. Discuss your options with your dentist and orthodontist before making a decision. If you’re ready to straighten your teeth, contact us today to schedule a consultation.